The ubiquitous transmission X-Ray in various forms has been the main tool to screen baggage, mail and cargo for decades. These systems are all based on rudimentary single or dual energy technology. These systems provide a basic distinction between organic, inorganic materials and metals. When used for automated explosive detection this results in a very high false alarm rate that is not optimal in an operational setting. Multi energy spectrometric technology configured as a Data Acquisition Systems (DAS) allows for much improved material discrimination that results in a much better ability to find and identify solid, liquid and homemade explosives (HME) in baggage, mail and cargo at a much lower false alarm rate. 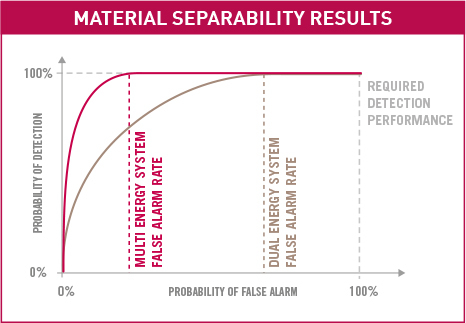 MultiX has shown a factor of 3 reduction in false alarm rate for a conventional X-Ray system retrofitted with its multi energy x-ray detector when compared with existing deployed systems under realistic operational conditions. MultiX has developed the ME100 that can be integrated and retrofitted into conventional transmission x-ray systems and airport scanner. MultiX provides then a better image quality and penetration ensuring that operator-based alarm resolution is as efficient as possible. ME100 is the real-time, room temperature, spectrometric detector available offering up to 256 energy bins. While it has been demonstrated that dozens of them are required to discriminate efficiently between materials, all competitors only offer up to 5 energy bins which is by far insufficient to discriminate. Each material has a specific X-Ray signature, ME100 spectrometer allows for real time identification of each material being screened. 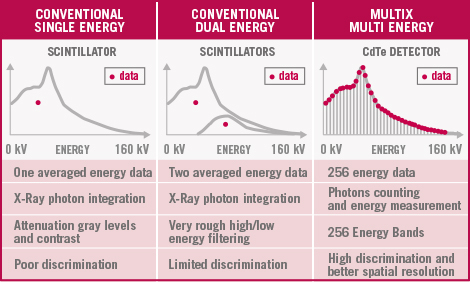 ME100 spectral digitalization improves the equivalent material and density analysis. The ME100 also allows for a much better measure of Zeff which is the main discriminator for conventional transmission X-Ray systems. The ME100, due to its architecture, also offers improved image resolution and penetration that aids efficient alarm resolution once a threat has been detected by the automatic explosive detection algorithms. 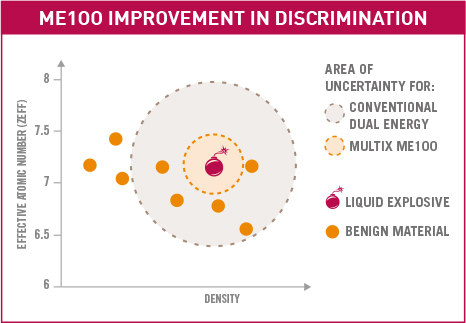 Significantly improved discrimination between all materials even that are very similar. High reduction of false alarm rate versus conventional single energy and dual energy X-Ray systems on liquids and solids including explosives and precursors (factor of 3 to 5). High effective passenger facilitation and throughput to security screening. Operating cost reduction for airport while increasing security standards. Easy system retrofitting with Multi energy.